We launched Christopher's BlogRadio.org site the day before BloggerCon. 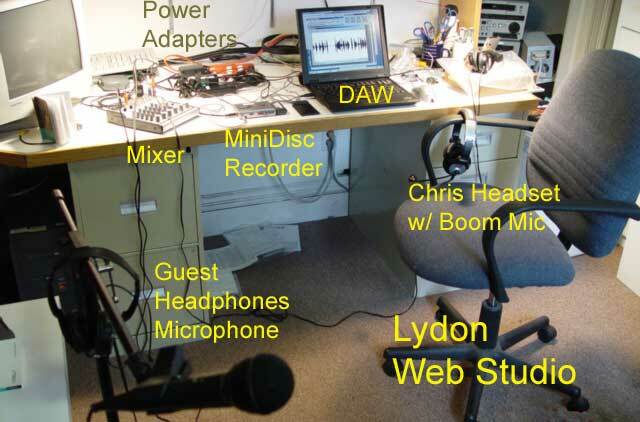 It incorporates material from thewholewideworld.net and the Lydon Blog. We added a sound montage to the home page, so Christopher starts talking as soon as the page fully loads. When you mouse around on the collage of images, the images come forward, and you hear Christopher introducing various guests. After 45 seconds, the current blog page loads automatically. We need to make each picture a link to the interview. And we need to make the individual interviews start playing sound on load? We learned a lot at BloggerCon. An important step is to make a single audio hyperlink that lets users choose their Media Player. Then we can open a special window that avoids the advertising and popup messages that happen when the browser plays the mp3 file by itself. We bought a new Sony MiniDisc recorder, the MZ-N10, because it advertised headphones out and line out jacks. It turns out these are two functions for the same jack! On our older MZ-R30, the headphones jack is available for post-MiniDisc monitoring (while the line out feeds the computer input). The headphones volume level does not affect the recording line output. With the MZ-N10, we can feed line out to the computer, but no monitoring of the audio! 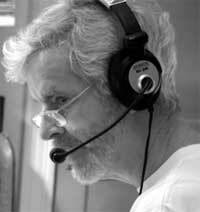 Output level from the JK Broadcast Host was low and had serious cross-talk from our host mic in the caller line. We have fallen back to the Plantronics MX-10 for telephone interviews. We succeeded in placing free VoIP Internet calls using speakfreely.org software. The mixer sends line level signals to the MiniDisc, which sends line level signals to the MobilePre. Headsets plug into the MiniPre for post-laptop (DAW) monitoring. The headphones jack is available on the MiniDisc for post-MiniDisc monitoring. The MiniDisc playback volume level does not affect the recording. 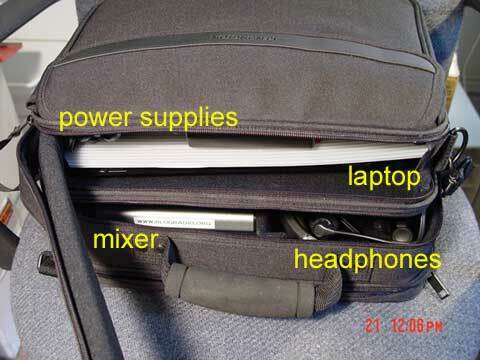 The latest info is that a more modern laptop might not crash with the MobilePre drivers. 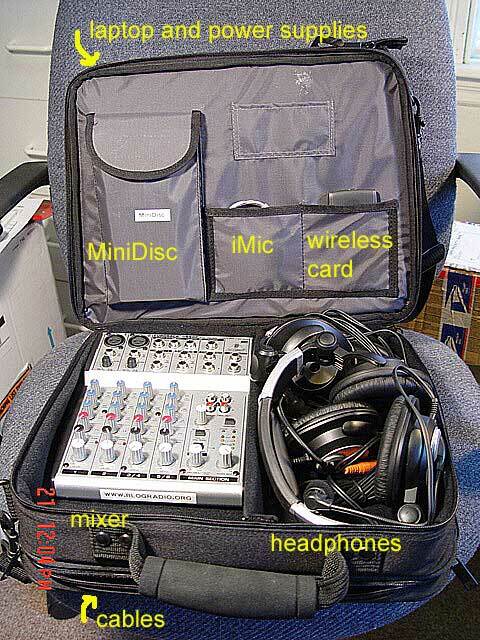 The studio shall fit in a single portable case (under-the-seat maximum size). It should contain everything needed. Power supplies and cabling must be organized and labelled so that Chris himself can set it up and break it down again in just a few minutes. When set up, the studio should occupy just a few square feet of desktop space so Chris can work with it most anywhere. Audio - classic studio with microphones, mixing board, recorder, and multiple monitor headphones. We will use boom microphones integrated with headsets to stabilize the sound level from guests. Basic studio supports Chris and one guest. 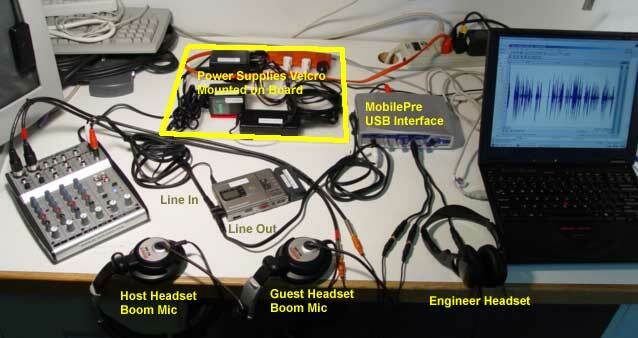 Two extra headsets can be plugged into the mixer for group interviews. Computer - laptop with DAW (digital audio workstation editing software), MP3 encode (Joshua Barlow on Real Audio). Telephone - interface to record high-quality telephone interviews. Can Mary receive a call while Chris is on another line? Just need two lines with rollover? A key idea is to make simultaneous recordings on two media (for example MiniDisc and laptop hard drive). This will back us up in the event of a computer crash and will archive the originals. Microphones Our first choice is a mic on a headset boom. These are widely available in "multimedia headsets" with price and quality ranging from under $10 to nearly $300. Most require "plug-in-power" provided by the microphone input jack on the computer and on a MiniDisc or DAT recorder. This means they will not work plugged directly into the mixing board without a 1.5V power supply (mixers have 48V phantom power for conventional condenser microphones). We have found some headsets with a conventional dynamic mic, and also located inline adapters that provide the necessary 1.5V+ for the electret condenser mics in multimedia headsets. Optional Lav mics - Sony electrets - from $30 to $250. Optional Cardioid voice mics (need mic stands) - Shure SM-58 etc. < $100. Nady SCM-950 studio condenser mics (need stands) - These will not be in the portable studio, but could be set up semi-permanently with mic stands for higher quality audio - for example if Chris interviews musicians who want to perform. Mixers We are studying two mixers that can fit nicely in the studio case. Soundcraft Spirit Notepad - 4 XLR mic inputs, 8 line inputs, 2-LED level indicators. User's Manual. Wiring Diagrams. Behringer UB-802 - 2 XLR mic inputs, 6 line inputs, 4-LED level indicators. Recorders We have explored a number of portable recording options to different media - MiniDisc, Compact Flash, Multimedia Card, Hard drive. In each case, we need a production path to MP3 for web delivery. We found devices that record directly to MP3, others that record uncompressed digital, then export MP3. We have an IBM Thinkpad 1151-370 running Windows 2000. We may rebuild it as Windows Me system so we can install Pro Tools Free. We want to record digital audio straight into the laptop. Griffin Technology iMic USB adapter provides stereo line input ($35). M-Audio MobilePre USB audio interface will provide line input/output and zero-latency monitoring ($150). Multitrack, but Mbox must be attached to use the software (Mary has one). MP3 export requires an extra-cost plugin, purchased separately for Mac and Windows. Multitrack (up to 8 tracks). Requires Mac OS9 or Windows Me (which we installed on Blogradio laptop). Telephony We need to record telephone interviews. We will investigate several devices to see if we can get a quality signal over the phone (with minimum hum, etc.) Professionals use ISDN lines to get good audio quality and raise the sound level of the remote party. Can we find a low-cost device with comparable capabilities? The best telephone interfaces use dual "hybrids" to separate the incoming and outgoing audio into two separate signals. And the best of the best use digital (not analog) hybrids (currently several hundred dollars). Things we learned the hard way. Problem: Multimedia headset microphones require plug-in power. Most sound cards provide it. MiniDisc recorders provide it. Mixers do not. Solution: Andrea Technology APS-100 inline power supply (2 AA batteries). Problem: Laptops have (monophonic) mic in only. We need stereo. Solution: Griffin Technology iMic USB adapter provides line in and line out. Problem: Tascam Pocketstudio 5 has one line-level and one mic-level input. Solution: Always use a mixer and feed stereo line-level outputs to Tascam. Problem: Mini 1/8" phone connectors are unreliable (noisy at times) for the microphones. Solution: When we arrive at the final design, we should rewire them with XLR connectors. Problem: Sound will not play through the laptop during recording. We want to monitor the sound post the last recording stage. Sound plays through while recording on the 2GHz desktop/tower (our PC audio/video editor). Solution: The tower has an Osprey 200 sound card. We need a better USB audio interface, and ordered the Creative Blaster and M-Audio MobilePre units today (7/17). Solution: Print out relevant steps from online Sony manuals. Add them to the case. ManualREC appears. You can now adjust gain manually with << and >> keys. Adjust to mid-range. This setting good for only this recording. Problem: Settings for Plantronics are hard, and different for skyBuilders Merlin phone and the Berkman phone? Solution: Best setting for compatibility switch is 2 for Merlin. Press down left-hand switch to record (right-hand switch stays up). Problem: No sound going into MiniDisc from Plantronics MX10, though we hear it clearly in the headphones. Solution: The MinDIN cable connector on MX10 was a little loose. Pushed it in hard and sound was restored. Bob Doyle, CEO, skyBuilders.com and Editor-in-Chief, CMS Review. Please post criticisms, new equipment suggestions, and good resource sites to the Comments section below.